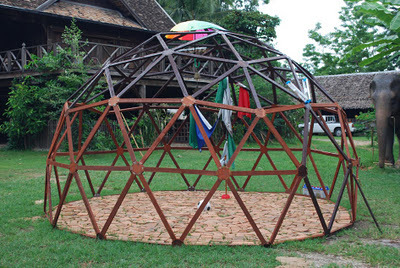 s artists from Australia participating in the Monfai artist residency program, we have constructed a large-scale geodesic dome structure in which we have placed a number of small sculptural objects. The geodesic dome is an architectural form pioneered by the American visionary R. Buckminster Fuller, in the late 1940s, as an efficient and sustainable method of housing. Weinstantly discovered a connection between Monfai as a cultural museum tasked with preserving and reanimating Lanna art and architecture, and Fuller’s dome design as an early example of sustainable architecture; Monfai strives to preserve the past into the future, whereas the dome, in the past, sought to preserve the future. Both goals are subject to constant upheaval through the passing of time. 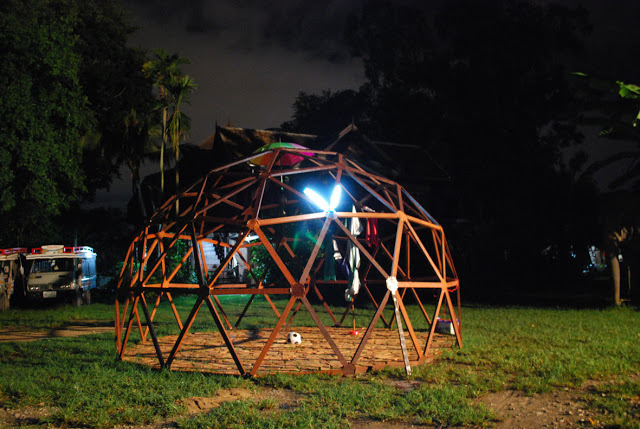 EBy leaving the dome as an open structure, an unfinished house, it suggests both symbolic and physical possibilities. There is a door, but if you go through it you are still outside. A dwelling without a roof is a lost space. However, it affords other possibilities. For this exhibition, we have placed a number of temporary sculptural objects collated via co-incidence throughout our time in Chiang Mai. By utilising specific objects, recognisably commonplace in contemporary living, we hope these works possess a sense of humour concerning our difficulty in understanding both the past and future. 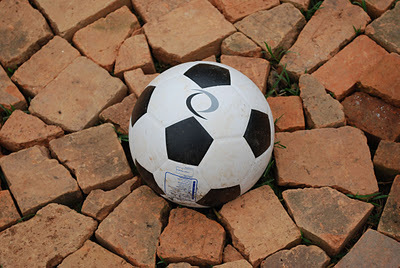 After the exhibition, these objects will be removed and the dome may be used for other purposes.